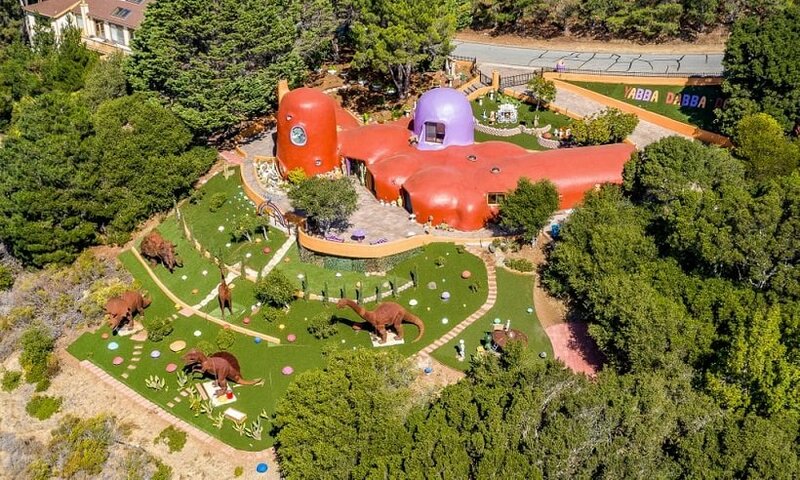 The quirky home features dinosaurs and a sign proclaiming ‘Yabba-dabba-doo’, but neighbors aren’t amused. California architecture has captured the world’s imagination with its classic midcentury bungalows and beach houses. But one architectural landmark in the state has gone a distinctively different route, and it’s not to the town’s liking. The “Flintstones” home in northern California appears to take its architectural cues from the town of Bedrock. Some people would call it art. For me it's just different, and why not? Let people live the way they like it. Not much different from abobe house in New Mexico. That house has been there for decades, it's right on highway 280 and I remember seeing at least as early as the early 70's. The current owner, a woman who used to own the SF Chronicle, just added the landscaping and the dinosaurs. If I recall correctly, the neighbors can't even see the landscaping that she has done, it's mainly visible from the highway. They should just mind their own business and let her do what she wants with her own house. Usual story. You can't fight city hall. America. Home of the free. This is an old story being reported as new news, this house has been there for a very long time and has been a source of complaints since it was built and the original owners did nothing but loose money when they sold it. There must be something more interesting than old news. And yes, the part of the property that is being complained about is only visible from the 280 Freeway. They should just mind their own business and let her do what she wants with her own house. In many parts of the world, bribes are required to even file building plans. More bribes to the inspectors and police who happen by. More bribes to get water, sewer and electric hooked up. Complain to "city hall"? More bribes to get anyone to check into it. When the miopic mind makes a comment about, "Can't fight city hall", and "America. Home of the free", I can only wonder what worldy experience they have dealing with entities within the USA and outside of its borders.